Well today my wife & I tried a gluten-free, dairy (milk) free pizza. As you probably know, a normal pizza would be loaded with gluten/wheat, milk (cheese), and all sorts of things. So if you can make a gluten free/milk free pizza, then you can make almost anything gluten/milk free! Anyways, we made it using normal Hormel pepperonies, Gluten free pizza sauce (Great Value brand), Bob Red Mill Gluten free/milk free pizza crust mix, and vegan (soy & rice based) “cheese.” We mixed everything up, and cooked it. I would share the recipe, except for the fact that ifyou buy the Bob’s Red Mill Gluten Free mix, then everything is pretty self explanatory (just mix the ingredients, add pepperoni, sauce, and alternative cheese). 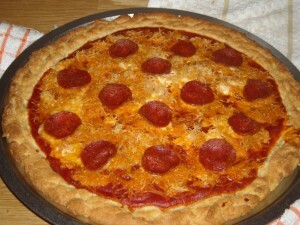 The dough was easy to work with–it did not stick to your fingers & hands as much as regular pizza dough. The only downside was that the artificial cheese was mostly soy based, which means it is harder for it to melt down. The rice based cheeses actually melts easier–so next time I make one I will probably try to buy the rice based cheese. The “cheese” was barely starting to melt when the pizza was done. By the way, most all of the ingrediets above can be purchased at your local supermarket. You may have to go to a health food store to find the vegan style cheeses (and possibly the gluten free crust mix). It all costs about the same as well. So what did it taste like exactly? Well, have you ever had one of those “Chef Boyardee” home style pizza kits? It tasted a lot like that, but actually just a bit better! I think I liked it better because the dough was a little bit of a better consistency/taste. But it tasted a lot like the home-made Chef Boyardee style pizzas. It was definitely worth it, and it tamed my craving for pizza for a while! !